Synopsis: Marina, a transsexual woman who works as waitress who moonlights as a nightclub singer, is bowled over by the death of her older boyfriend. Now that the Academy Awards are over, American audiences are finally getting a chance to see the foreign language nominees as they trickle over to the States in theatrical release. This includes the Best Foreign Language Oscar winner from Chile, Una mujer fantástica, or A Fantastic Woman. Writing about A Fantastic Woman is tough, because everything about it, including the simplest of major plot points, could be considered a spoiler. For this reason, I’d recommend that you go and see it, then come on back and read what I have to say. This review will be waiting for you. A Fantastic Woman is about a transgendered waitress/singer named Marina Vidal (The Guest‘s Daniela Vega) whose older boyfriend, Orlando (Francisco Reyes from Neruda), unexpectedly dies. Suddenly, amidst all of her mourning and grieving, Marina is forced to deal with the authorities, who somehow suspect her of foul play, and Orlando’s family, who accuses her of trying to sneak in and inherit Orlando’s modest estate. It’s a simple story, really. What makes A Fantastic Woman so effective is the motivations of the characters. When Orlando dies, Marina is treated with suspicion from the start, first by doctors, then by the police, and finally, by Orlando’s family. The screenplay was written by Sebastián Lelio (who also directed) along with his writing partner, Gonzalo Maza (the pair also did Gloria and The Year of the Tiger together), but many of the situations seem as if they could have been ripped right out of leading lady Daniela Vega’s real life. The actress is a trans woman herself, and the audience can’t help but feel as if the mistrust and disgust that the other characters feel towards her are a little too authentic. For example, in one scene, the police insist on photographing Marina’s naked body as part of their investigation, and the process is both degrading and disrespectful to Marina, to the point where the officers won’t even call her “Marina,” instead only referring to her by her given name – “Daniel.” In another scene, Orlando’s family kicks Marina out of the funeral, and their disgust and hatred (and the hurt that Marina feels because of it) is palpable. One has to wonder how many, if any, of these segments have been pulled from Vega’s real experiences. Through all of this, or maybe because of it, the audience connects heavily with Marina, not really feeling sympathy for her, but rooting for her. It connects with her sadness and heartbreak, but also with her hope for the future and her love for Orlando. 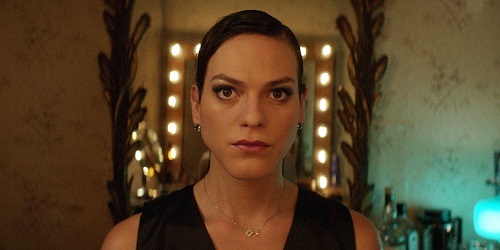 A Fantastic Woman becomes a mystery, part of which is all of the pieces of Orlando’s life coming together, but a bigger part is Marina finding strength in the face of aberration. And Daniela Vega plays this dichotomy perfectly. A Fantastic Woman is an important film, and not just because of the transgender angle or the fact that it won an Oscar. It’s a good, hard look at the grieving process through the eyes of someone who has no one to turn to in their time of mourning. And it does it without ever feeling sorry for its lead character. It truly shows the Woman as Fantastic. Shot by cinematographer Benjamín Echazarreta (Mozart’s Sister), A Fantastic Woman has a very sincere look to it. The camera work is very intimate, telling the story with just as many close and sensitive angles as it does it with wide, all-seeing shots. The lens seems to look deeply into Daniela Vega’s soul in every frame that she’s in, which goes a long way towards building her character’s unbreakable bond with the audience. Echazarreta’s unblinking camera follows Marina throughout the entire film, giving the viewer a real sense of the ordeal that she is going through. There are a handful of fun trick shots that layer images in reflections, but for the most part, the cinematography in A Fantastic Woman just shows Marina’s character as honestly and as genuinely as possible.